Creamy, rich and delicious! This vanilla yogurt panna cotta gets drizzled with honey and topped with some sweet crunchy candied walnuts. Yogurt, milk, sugar, gelatin, vanilla extract, honey, walnuts, agave nectar, and brown sugar. An easy make ahead dessert that everyone will love! A panna cotta is an Italian dessert that literally means “cooked cream.” It’s cream (or some other creamy liquid) that has been thickened with gelatin and refrigerated. It’s then either unmolded or not and usually served with some sort of sauce. After I made my very first panna cotta, I was completely hooked. It’s so easy and elegant and I love that you can make it not just with cream, but with any creamy type liquid. My formula is 3 cups of liquid to 1 gelatin packet. I’ve made them with Nutella and over the holidays I made one using Holiday Nog. Once you start making panna cottas, you’ll start to see the possibilities everywhere! Whole Milk – you can use cream if you want it richer and creamier or 2% if you want it lighter and not as creamy. Gelatin – one gelatin packet which is 2 1/4 teaspoons. Plain Yogurt – can use Vanilla Yogurt. Full fat will be creamier, lower fat not as rich and creamy. Vanilla Extract – I use my Homemade Vanilla Extract. Agave nectar – can use honey. Pour the milk into a saucepan and sprinkle the gelatin on top. Let sit for 5 minutes to soften. Then, over a medium heat, stir to dissolve the gelatin. Add the sugar and stir until it is dissolved also. Remove from the heat and whisk in the yogurt and vanilla extract. Pour into one large bowl or into six 1/2 cup ramekins. If you plan on unmolding them, very lightly grease with a cooking spray. I usually just leave mine in their bowls. Refrigerate for at least 2 hours, but preferably overnight. Making these candied walnuts is so easy! Preheat the oven and line a baking sheet with parchment paper. Spray parchment paper with cooking spray – making sure they won’t stick. In a bowl, stir together the walnuts, brown sugar, agave nectar and a pinch of salt. Spread them in a single layer on the baking sheet, be sure and break up any clumps. Bake them for about 20 minutes. Remove from the oven and allow to cool. These walnuts are great for just snacking on their own or use them to top other desserts. 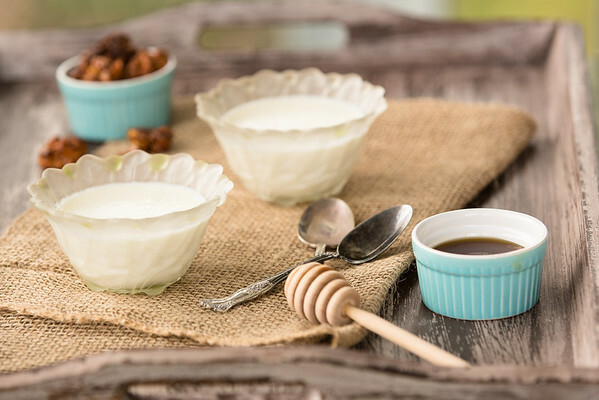 Vanilla Yogurt Panna Cotta with Honey and Candied Walnuts is a healthier dessert that you can feel good about eating. Place milk in a small saucepan and sprinkle gelatin over the top. Let sit for about 5 minutes for the gelatin to soften. Turn burner on to medium and stir until all gelatin is dissolved. Add sugar and continue stirring until sugar is dissolved. Turn off heat and whisk in yogurt, vanilla extract and salt. Pour by 1/2 cups into 6 individual dessert dishes. Chill in fridge for at least two hours, but preferably 4-6 or overnight. Preheat oven to 325. Line a baking sheet with parchment paper or spray with nonstick spray. In a medium bowl combine walnuts, agave nectar, brown sugar and salt. Stir to coat walnuts evenly. Spread in a single layer on baking sheet, breaking up clumps. Bake for about 15 minutes. Remove from oven, allow to cool, and store in an airtight container. 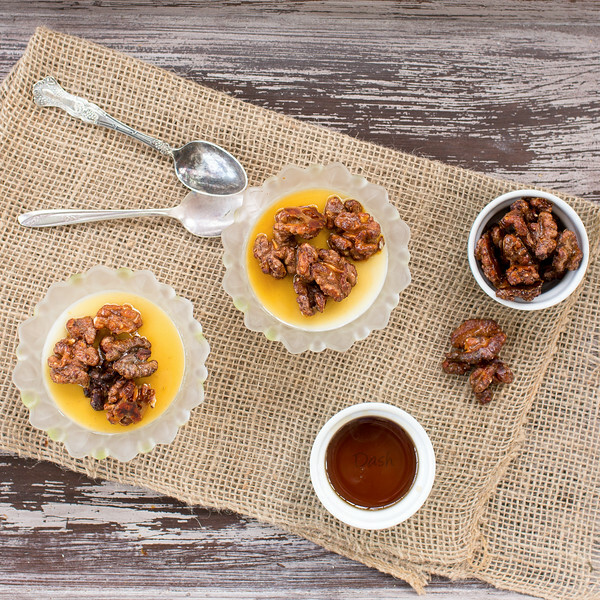 To serve, remove from refrigerator, drizzle with honey and top with candied walnuts. Panna Cotta will need to chill at least for 2 hours in the fridge. Milk - whole milk will make a creamier and richer panna cotta. Can use lowfat, but it won't be as rich or creamy. Yogurt - full fat will be the richest and creamiest, low fat will not be as rich or creamy. The recipe makes more candied walnuts than you need, but you'll find plenty of uses for them - even just as snacks! Store in an air tight container. Well actually most people spend their time eating tzatziki in Greece….or wait was that just me? 😉 This panna cotta however looks incredibly delicious! Candied nuts are the best! It’s sooo worth the extra step! I would gladly eat tzatziki in Greece! These photos are gorgeous!! I’ve only made panna cotta once before, but now I’m craving it. I love that this is yogurt-based! I’ve eaten it at restaurants but never made it. Must give it a try. This really sounds amazing!! I would love one right now. Absolutely love everything about this. I often buy honey yogurt because I love the combination of the two…adding a bit more WITH candied walnuts? Heaven. You sold me with that first shot! I’m a sucker for anything using honey, but the candied walnuts just make the whole thing shine. Stunning! I love yogurt and honey together! Can’t wait to try this! Beautiful! Love those candied walnuts on top. Wow! This looks so decadent, but yet healthy. I would love this topped with fresh berries. This is a delicious dessert, Pam. Thanks so much for sharing your awesome recipe with Full Plate Thursday and have a great week. Okay, I HAVE to make this! Pretty sure I have all the ingredients on hand too. Sunday treat time! Stunning photography on this one! You are making it irresistible! It’s so easy and so good! I love the nuts here for some texture. And I would choose plain yogurt every time too! They do had that special crunch! I think I’ll be adding candied walnuts to lots more things! Panna cotta! Love it. So cool, silky, and light. Also love your idea to top with candied walnuts. Great contrast. I know! Isn’t panna cotta the best thing ever! Would you believe I have never, ever made Panna Cotta? Ever! Why oh why I don’t know. Heaven knows I am no baker! Panna Cotta always looks so elegant to me and when prepared like this, goodness no guilt either! I have never tasted a panna cotta but it looks so simple. I love that all the ingredients are ones I already have. This sound delicious. Do you have a Trader Joes-they have a good Greek yogurt. What a lovely treat! Panna cotta is one thing I have not tried yet but with your assurances that it’s super easy, I’m not as afraid of tackling it as before. It is super easy! You know if I make it regularly it has to be easy! I always have Chobani plain in the fridge so I can make my chia seed pudding. And now I have another use for it! I really need to try chia seed pudding! Churros and hot chocolate (with a cinnamon stick) in Spain. Sfogliatelle and a macchiato in Italy. Vanilla Youghurt Pannacotta with honey and walnuts at Chez Sidewalk Shoes. I can dream. . .
Well, the candied walnuts alone are enough to recommend this dessert! Well done, creating something new based upon your food fantasy. When my son and daughter in law were in Paris during their honeymoon, they ate lots of croissants. Mike just loves them, and he ordered by pointing and holding up 2 fingers. They also drank tea, but think coffee was also common. Lots of bakeries with coffee? Your food fantasy fulfilled – again! Now, if only I could actually go visit those places! We spent a Christmas in Greece, and yogurt was on every menu, so you are spot on, imho. I’ve never tried panna cotta, but I’ve got a bag of walnuts sitting on the counter and a new honey jar. Beautiful photos! Oh good!! I love when things are just as I imagined them! I bet this would almost be healthy enough to eat for breakfast! 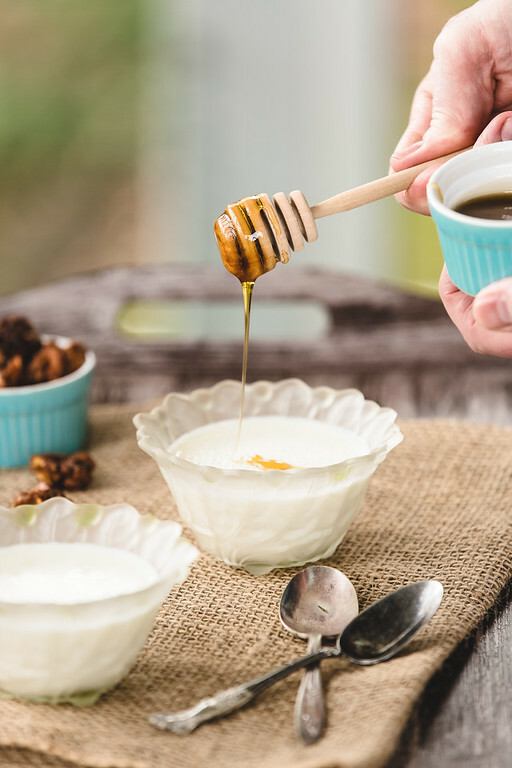 Love the pairing of greek yogurt with honey – it just tastes so good. Definitely healthy enough for breakfast!